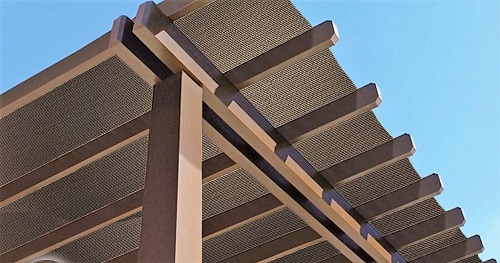 Coolaroo, as well as many other manufactures, make an ideal shade screen fabric that can be adapted for multiple uses. It is perfect to cover dog runs, enclose patios, cover gazebos, add privacy to fences and create shade for your garden. On the screen accessories page are a variety of clips and ties to make working with shade screen easier. This is a lattice patio cover with the Paradise Sunblock Shade Cloth intsalled over it to provide protection from the sun. It comes in an 8' x 50' and can be intalled in a numberr of different ways. For just $68.99 there are many uses for this shade screen material. Find this and many other options here.